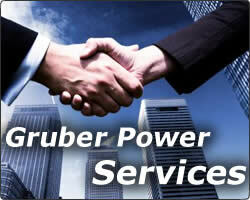 Gruber Power has been providing power protection solutions since 1984! Our expertise ranges from small PC based power protection products, to the largest of UPS/Power Conditioning and Distribution Systems, and encompasses all the technologies available from solid-state products, to rotary and engine generator design systems. Our corporate headquarters is located in the "Valley of the Sun" or better known as Phoenix, Arizona. The wonderful weather nearly year-round helps us attract and retain a very talented labor force. Gruber Companies is located north of Phoenix near the Deer Valley Airpark. Five buildings (approximately 60,000 square feet) house three production areas, two sales/marketing groups, a machine shop, a paint/body shop, a recycling operation, multiple warehouses and two service areas. From downtown Phoenix, take Interstate 17 (I-17) North to the Deer Valley Road (East) exit. On Deer Valley Road head East over to 2nd Avenue and turn right. Heading south about 500', you will see the main Gruber building on the left-hand side. The street address is 21439 North 2nd Ave.